Are you watching the big game by yourself or with your loved one? 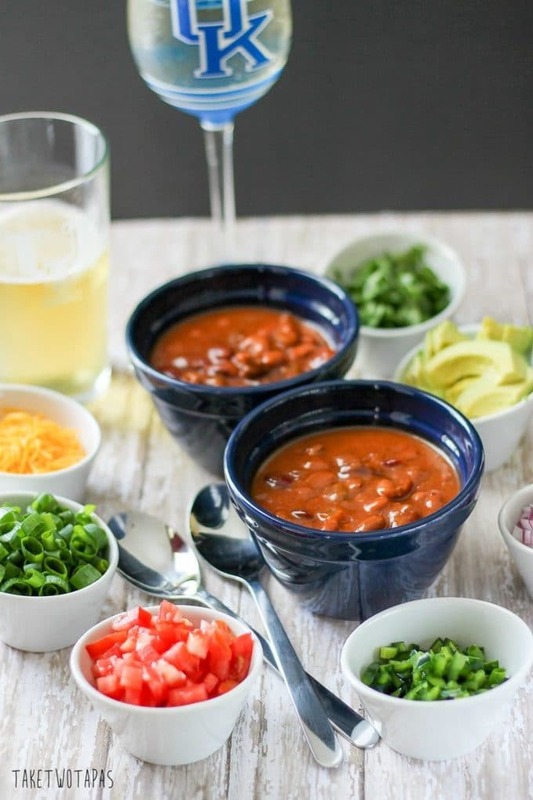 This chili from Progresso serves two and is the perfect meal for halftime without a lot of fuss! I love tailgating and celebrating Game Day with friends and chili. The ceremony, the superstitious rituals that we do, dressing in team colors, chowing on a variety of Game Day foods. I love it all!!! Nothing brings people, strangers or friends, together like mutual team cheering and referee bashing! I may not understand all the intricacies of football but I love the atmosphere. Basketball is similar but since there are so many games, we watch a lot of them with just family. If I didn’t watch the games with my husband, I would be considered a basketball widow. The Kentucky Wildcats are the team of choice in our house. Blue and White all the way!!! Thank foodness (yes that is a word) that they win quite a bit because it gets loud in our house during the basketball games. Right now it’s football season but we still watch Kentucky when they are on TV. Loyal all the way. We also cheer for the Jacksonville Jaguars since Jacksonville is my hometown! Last weekend Brooks came home after being gone for work all week and brought a cold home with him. Sneezing and coughing and all that comes with it. This included lying on the couch all weekend watching football. I ended up cooking and making recipes for the blog while he was yelling, albeit quietly, at the TV. Since we weren’t going to be attending or hosting, any Game Day parties, we didn’t need to make a fuss about eating. 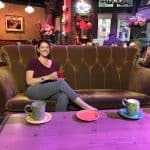 What is fun to make for two people? Chili!!! Brooks makes a killer chili, but since he was sick, I didn’t want him to cook and spread his germs to my food. I grabbed the new Progresso Smokehouse Chili and made a toppings bar! Brooks and I like different toppings so build your own chili was the best route. I have lots of toppings on hand at all times since we are huge taco fans so that made for a great chili bar! We could each make our own chili and be happy, quietly cheering on our Kentucky Wildcats. I gathered some sour cream, cilantro, fresh tomatoes, avocado, green onions, red onions, cheese, and hot peppers. Brooks likes sour cream and cheese. I like avocado and red onion with a dash of jalapeno. 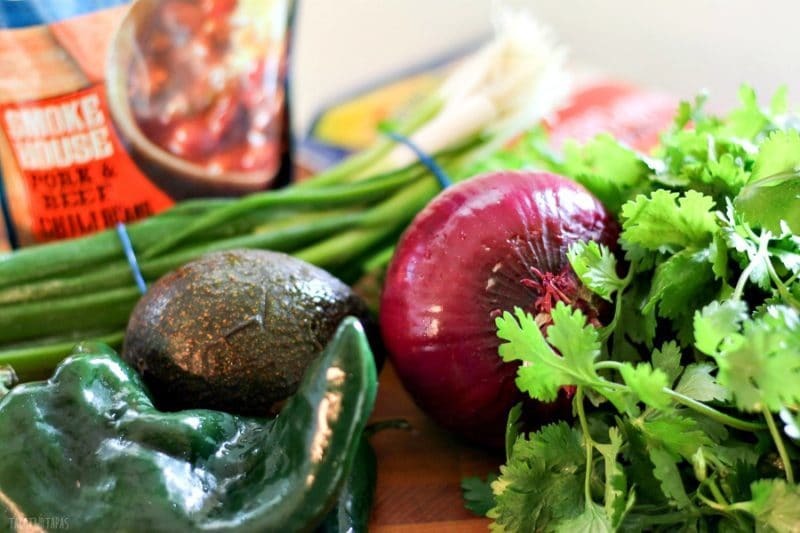 You can mix it up and add poblano peppers for a smoky heat. If you go the Chicago way you can add it to noodles. My Ma used to make chili and spaghetti so it is near and dear to my heart. Don’t make fun because chili and spaghetti makes a meal! Progresso Smokehouse Chili was the perfect amount for the two if us, and with our own toppings, we got to have it how we liked it. 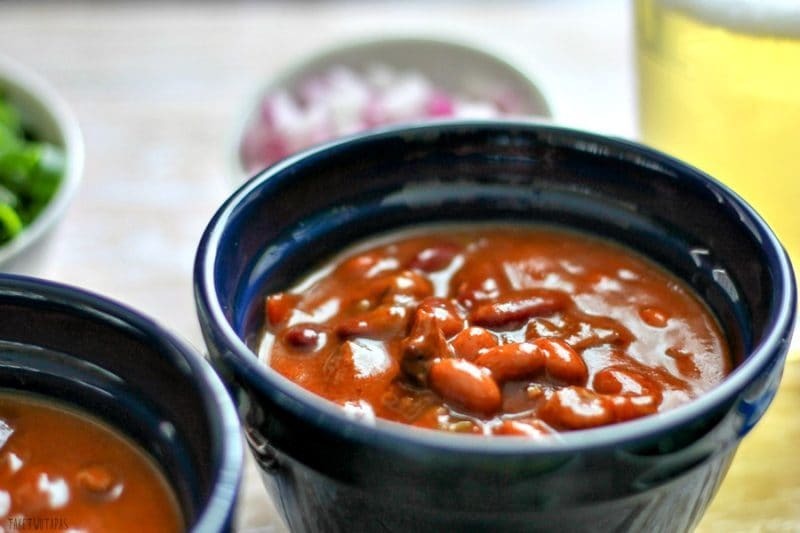 It has the right amount of smokiness and it is full of beans and meat so it is very hearty. 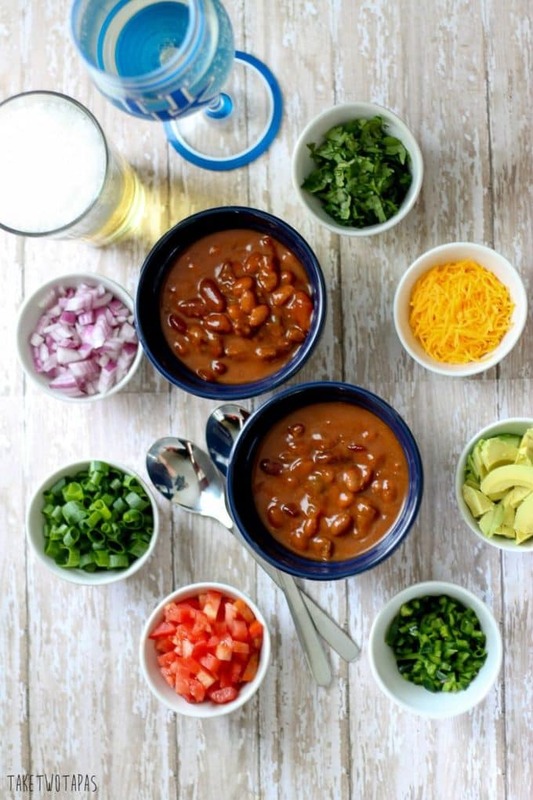 With our cool toppings, we could spend more time yelling at the refs than arguing about what to put on the chili. Plus there are no pots to wash!! More TV time! Progresso also wants to give you some great prizes! 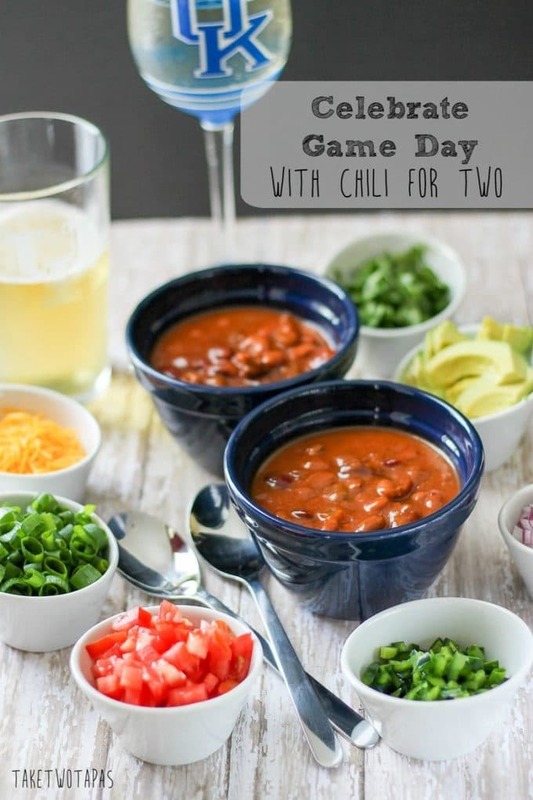 Enter the giveaway for great Progresso products for your Game Day Celebration! To be entered in the giveaway, you must go the Progresso Game Day Page, come back to my post and comment below. Tell me what recipe you want to try and you will be entered. Only those that leave a comment will be eligible. You will want to enter because Progresso is giving away a Game Day chair, chili and stew, and a kitchen ladle! Visit Progresso on Facebook and see what others are making for Game Day. Want a coupon so you can enjoy this great chili? Download one here! 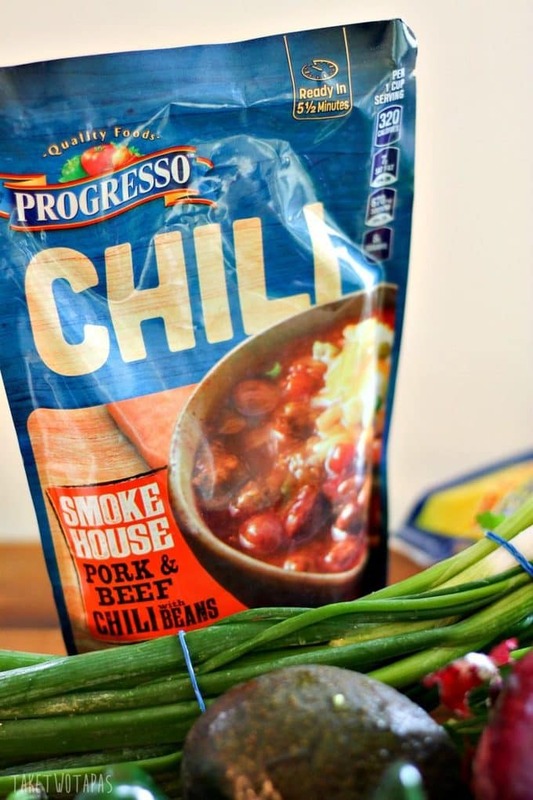 If Game Day isn’t your thing, Progresso has lots of other recipes and products. Check them out here. « Andouille Corn Dog Bites for Game Day! I’ve never tried tachos before so the chili tachos seem really great. Chicken tachos are going on the menu for our next tailgating party! Those are fun for a cozy night in! We must not be as creative as most folks. The only time we eat chili is on Frito pie or chili dogs. I looked through those recipes and I can’t believe the great ideas people have. My favorite is the chicken chili nachos. It not only has nachos, which are a common game-day fare in our home, but it uses chicken chili, which I have never tried before. I like to think that I am creative but I still get in a state of awe when I see what some people come up with!! Thanks for reading! I’d love to make the chicken nachos! Chicken nachos are so awesome! That was my favorite too! Anything with buffalo in it is great! Thanks for reading! Boy oh boy do I love chili!! Yours looks incredible!! Thanks Michaela! I want some of that bean salad! I noticed that not watching the game at all is not an option in your little quiz up top 😉 I’d never survive in a Southern town. Everyone would HATE me. But I do love chili. Best thing about the colder temps.